New fashion designer Elsa Kjartansdóttir’s colourful and edgy patterns make for out-of-this-world pieces, inspired by the 50s yet uniquely modern. 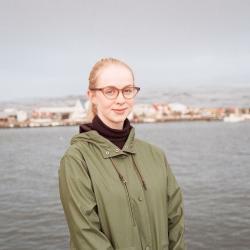 Elsa recently returned from an internship in Paris for the accessories design label Yazbukey, and is currently working for Icelandic design label Scintilla. I was in kindergarten when I learned there was such a thing as a fashion designer and immediately decided I’d become one. I created dresses draping scarves around my sister, which she did not love. I eventually went on to study fashion design at the Icelandic Academy of Arts. That was where it all started. I find inspiration all over the place. There are however some genres that have become my personal favourites, such as Soviet graphic designers, Bauhaus, florals, tiki, 50s erotica and fashionable older women. I believe the last two are connected. I’m keen on specialising in print design, and am therefore constantly on the lookout for shapes. I usually look at pictures online, or in books, and once I find a picture that really sparks my interest, I cut it down into pieces. I study the mood, shapes and patterns, and once my mind is totally consumed in the pattern, I sketch an idea from it, edit the sketch and develop the idea even further. What is your favourite piece of clothing by another designer? I love my Swarovski studded starfish earrings from Yazbukey. I interned at the Yazbukey brand in Paris earlier this year and still really miss the Yazettes. Another favourite is my gigantic scarf from Scintilla, an Icelandic design company I currently work for. I also own a blazer that is over 50 years old, handed down to me by my grandmother—a style icon. I also love Sigga Maija’s pieces, her prints are bold and beautiful. What do you wish to achieve through your designs? I’m interested in the slow fashion movement. I want the aesthetics of my designs to be inviting, and I would love to design for different kinds of people of all ages, shapes and sizes. To gain more experience! And hopefully to get a job abroad in the next year. I am also constantly fantasizing about a sustainable, ethical, multi-size brand.